These lovely beads are sure to add a touch of glamour to your designs and can make even simple je..
Each 80 gram mystery bag contains an eclectic mix of beads and jewellery making findings that typ.. These cinnamon crackle glass beads feature a lovely sheen and measure 6mm with a 1mm hole. .. These quality hematite semi precious beads are really stunning and they have a nice sheen which.. This silver plated craft wire is perfect for incorporating within a wide range of jewellery makin.. This quality black hollow tubing is ideal for adding another dimension to your designs and perfec.. 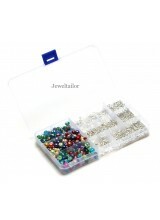 These genuine Swarovski Xilion crystal beads are ideal for adding a touch of sparkle and glamour .. This quality coated bracelet memory wire is ideal for creating interesting bracelets (as seen in ..
Do you make your own jewellery but are yet to experiment with making rings? Or perhaps you're new to.. These are great quality shiny round 4mm spacer beads to enhance your designs and ideal for everyd..
Keep your art,craft and household items organised and easy to retrieve with our range of storage boxes. 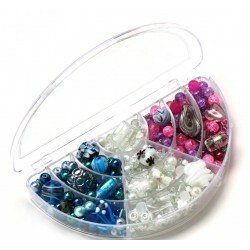 These clear, plastic bead and craft storage boxes feature 10 separate compartments, and a snap sh.. 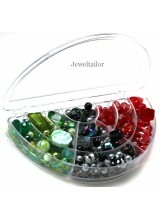 These clear, plastic bead and craft storage boxes feature 15 separate adjustable compartments, an.. 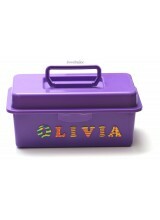 These stylish carry handle storage boxes can be personalised with a name of your choice (up to 8 .. These vibrantly coloured letter beads are available in letters A-Z, are 100% lead free and large .. Create your own unique designs with this stylish Impressart handmade wording design stamp wh.. These stylish, premium quality, turquoise howlite gemstone chip beads feature a range of shapes i.. This lovely matt, black tissue paper is acid free and machine finished to ensure every sheet is e.. This rose gold plated craft wire is perfect for incorporating within a wide range of art, craft a..